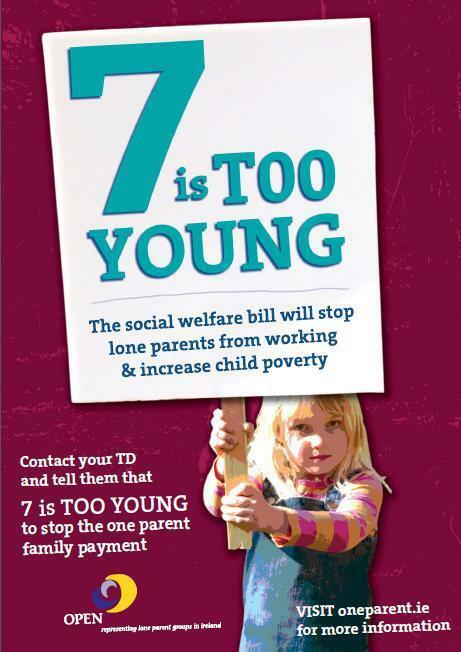 The Social Welfare Bill 2012 begins its journey through the Oireachtas tonight . It proposes changes to the entitlement to the One Parent Family Payment, Pension age qualification and also will introduce new fraud control measures. There has been very little said in public discourse about the changes to the One Parent Family payment and the fact that in two years time lone parents will not receive parenting support when their child reaches 7 years of age and if they are not in work will have to apply for jobseekers allowance. Since 80% of lone parents are either working or in education and there is no child care support outside of the part time year between 3 and 4 years of age, where are children over the age of 7 to be supported in the future? There were changes proposed by previous governments which would have seen a reduction in the age of the child supported by the payment but would also have examined employment supports and childcare provision for those affected. No such plans are provided for in this bill under debate this week. There isn’t enough after-school childcare and no plan in place to provide it. We don’t have a social welfare system that supports those in Jobseekers to work part-time which is a reality or a choice for many lone parents. We don’t have enough education & training places for those who are already on the Dole. We believe that poverty, especially child poverty, will increase among lone parents if this Bill passes. Unemployed lone parents will be at the bottom of the pile on the Dole. This means they will be the last grouping to receive active support to get into work. Employed lone parents will have to make the awful choice between trying to work full-time, with little childcare support or moving on to welfare. Some say that One Parent families are supported into long term welfare dependency. However as so many are working or in education maybe it’s the bigger societal and economic system that is broken and not the parents trying to survive and provide the best opportunities for their families. They still appear in the most at risk of poverty statistics of the state and will continue to reside there for much longer if these changes go ahead and if there are no jobs or supports into employment provided. But the poor don’t matter in the scheme of things or do they? The One Parent Family Payment also supports (mainly) mothers to keep their babies ( a lower number are in this position with most lone parents having been in relationships that have broken down for a variety of reasons.) However it is important to note the role of the payment in supporting people who are in crisis about their pregnancy. Especially important in a state which continues to fail to legislate. Clare Daly and the technical group are bringing in their private members bill on Medical Termination where the mothers life is at risk. The debate on that bill begins 90 minutes before the Social Welfare Bill 2012. The government will oppose this bill. The irony is not lost on me at all. Austerity politics with no reflection on equality or the impacts and outcomes on people’s lives does not serve anyone well. One day we might actually continue reform on the flawed system for reform’s sake rather than looking at lifestyle opportunities which do not exist. The proposals feed into myths and discrimination against lone parents because they don’t reflect on the increasingly diverse reasons for and responses to lone parenthood. And of course there has been no reflection on the role and responsibility of the other parent. 7 is far too young to place a child at risk of consistent poverty (no child should be placed at this risk) and lone parents deserve the opportunity to work and have their role as a parent alone supported. Everyone deserves the chance to work. However we seem to spend a lot of time talking people out of jobs rather than working on creating them and the people that might take them up.